The United States has almost as many personal computers as people. A small minority of these computers are customized works of art. 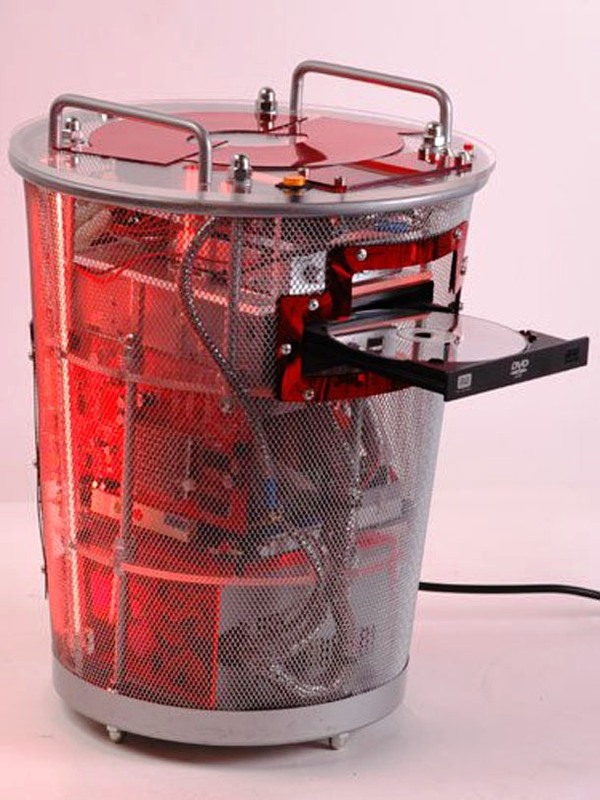 Here’s a fully functional computer built into a metal mesh 5 gallon bucket. This machine follows in the ancient 5 gallon tradition of portability. Notice the handles, for quick and easy transport! I’d love to build a computer like this. If any readers know if and where I can buy a chassis like this, please let me know in the comments. Not all custom built computers are works of art, of course. In my poorer days, I had a computer I called “Frankenbox” that I rigged to boot up from a broken 20 gig iPod. Its Pentium D processor eventually went up in smoke. That’s why you’ve probably never heard of Pentium D. You can see my new unique setup at 5 gallon computer desk. Here’s the ugliest working computer I’ve ever seen. The case is an old milk crate, and the components are sealed in with spray foam insulation. Update: A few readers have demanded to know more about the milk crate computer so I’ll provide some details about it below. 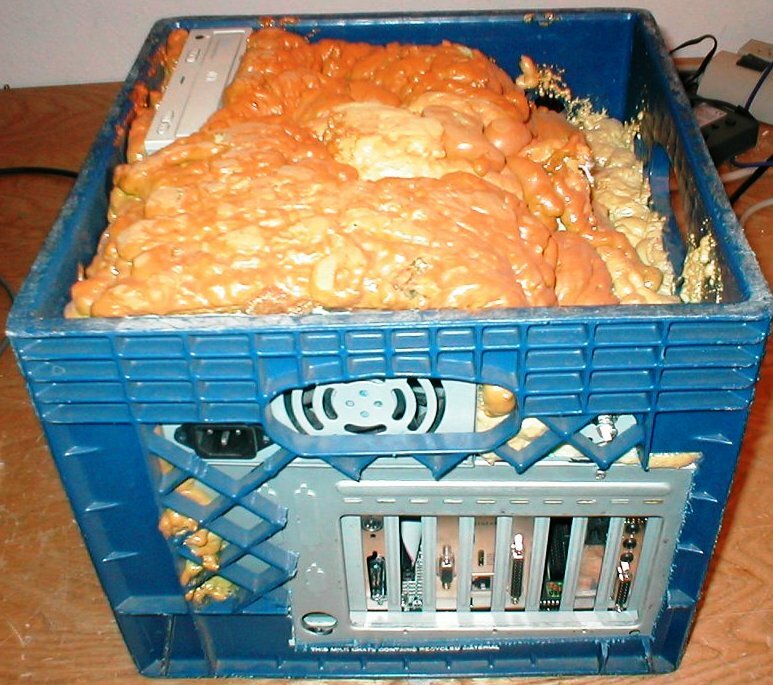 This computer was found by a worker in a computer recycling center. The original owner is unknown. The processor is an old 333 mHz AMD, and would not overheat even with the thick layer of insulation. Surprisingly, this computer was functional at the time this photo was taken. This picture is from the /r/techsupportgore subreddit. Visit the thread to see more pictures. Update 2: I’ve made my own five gallon computer which you can read about on the cable management article. See the HomeDepot link or other office supply sites for the mesh wastebasket. Looks like they use plexiglass for the internal shelves, with some rods and handles available at your favorite hardware store (or if you’re like me, you’re own “Fibber Magees” garage” where all kinds of old junk is laying around). The ‘chassis’ looks exactly like trash cans we have in our home offices. I think they may have been originally from Ikea but we bought ours at Goodwill, and I see them there somewhat regularly. Great site!